Barcelona is one of the most child-friendly cities in Europe, given its numerous parks, play-areas, beaches and activities. As the specialists in the family relocation, we have listed some activities and places we think you should know before coming to Barcelona with kids or living here. Poble Espanyol the architectural and cultural wealth of Spain in one place plus activities for children to see and participate. CaixaForum, a contemporary arts space, makes life easy for parents by accompanying its exhibitions with children’s workshops. Don’t forget to visit the oldest magic shop in the World El Rey de la Màgia founded in 1881. Find more about the city’s best family-friendly venues. Barcelona’s parks and squares have more than four hundred and fifty play areas so that children can enjoy playing outdoors. Use them as places to meet, relax and have fun. More about Barcelona parks for families and kids. Get to know the best spots in Barcelona for families and fresh air to meet. Opening hours: few restaurants open before 1pm for lunch, and you may find staff still setting up and surprised to see you nearer 1.30pm. It’s a similar story in the evening, with most restaurants not opening until 8.00pm or even 9.00pm. You can get around this by going to one of the many bars that do tapas. These places are usually serving by 11am and continue throughout the afternoon. You’ll find many have a decent selection of hot and cold dishes that you can adapt around kids needs and still have a satisfying bite yourself. Croquetas or a bikini (ham and cheese toasted sandwich) are my go to kid-friendly menu items, but you will usually find something that will do the job. Sometimes kids’ menus don’t come as standard (local kids are expected to eat what everyone else eats). Don’t be afraid to ask if they could suggest something suitable for fussy eaters – often there are simple options that are not listed on the menu, like some pasta with plain tomato sauce. Highchairs are often available, baby changing facilities are unfortunately in short supply. Children are genuinely welcomed in Barcelona. Pushchairs are accommodated, mess is cleaned up and less-than-perfect behaviour is generally shrugged off. 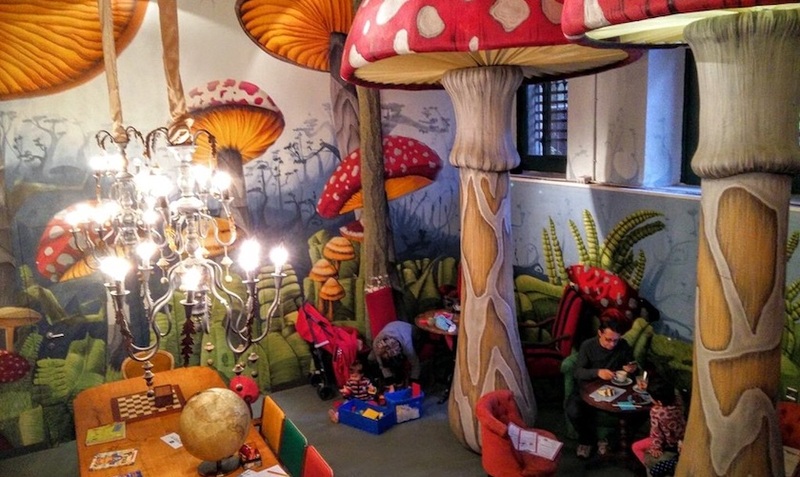 Child-friendly places to eat in Barcelona Restaurants, cafés and fun places to feed the kids in Barcelona. Have you decided to move to Barcelona with children? The question of selection of the right school comes first. Even the location of your new home will depend on the school’s location. See how to choose the best school in Barcelona for kids. Every day, Barcelona offers you all types of activities for children of all ages. Look up all the available children’s activities and you’ll discover a wide variety of options. Barcelona offers programmes such as “Growing with you”, which is aimed at parents with children under the age of 3. You also have resources for using technologies in education. Free time is the ideal time for children to learn and play. Young children can be introduced to music at the escoles bressol (kindergartens), spend time at family centres, or enjoy cultural activities at Barcelona’s libraries, civic centres and new media learning centres. Enjoy the resources that the city provides so that your children can make the most of their free time. Barcelona offers year-round sports activities and runs awareness campaigns on the benefits of doing sport. Discover all the children’s sports activities available at school, and at the sports facilities and summer casals (centres) around the city. Use our local advice on how to move to Barcelona smoothly and where to spend a quality time with your children in Barcelona. Relocation to Barcelona is simple with us!